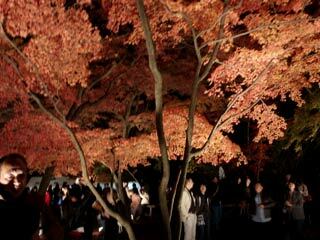 During the middle of November, Nagatoro (長瀞) has great light up Koyo, autumn leaves, at Momiji park. There are 100s of Momiji, Japanese maple trees, are planted and in the Autumn all of them change their color of leaves to beautiful red. Light up from 17:00 to 21:30. Many people visit here and enjoy great light up Koyo. During the light up, there are also music events, and food service are available. Also, Hodosan Shrine has small but beautiful light up.